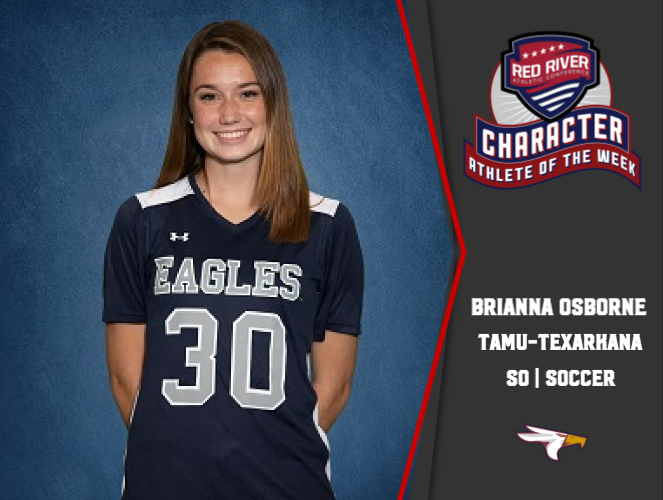 Texas A&M University-Texarkana soccer player Brianna Osborne was recently named the Red River Athletic Conference Character Athlete of the Week. As part of the RRAC's commitment to the NAIA Champions of Character program, the conference recognizes student-athletes from member schools that have exhibited a high level of scholarship, sportsmanship, integrity, responsibility and community service. One student-athlete is selected each week based on character and commitment to his or her school and community. Osborn is a sophomore Kinesiology major from Plano, TX with a 3.10 GPA. She plans to enroll in a physical therapy or nursing school after graduation. Coach Don Koontz praised Osborn’s focus both on and off the playing field, saying “Bri is an outstanding young lady that is the definition of a student-athlete. She is responsible, reliable, and has a great relationship with everyone that she comes in contact with." • Volunteering for the First Kickers Program, which introduces the game of soccer to kids ages 3-4. • Participating in Stuff the Bus, a fundraiser that provides school supplies to kids. • Serving in the Laces for Grace program by distributing shoes to area kids during Back to School. • Volunteering for Christian Warriors, an event that provides food, coats and spiritual needs to the community. • Contributing time to RRAC canned food drive at soccer championships. • Filling role as a Soccer Sister, an initiative where players mentor, practice and support one another through soccer. • She can be counted on to always do the right thing on and off the field. • She is respectful of all TAMUT leadership while being very polite. • She gives full effort to school, soccer and the community. Texas A&M University-Texarkana is a member of the National Association of Intercollegiate Athletics’ Red River Athletic Conference. The university fields teams in Men’s and Women’s Soccer, Men’s and Women’s Tennis, Baseball, and Softball.